A 14-month-old kitten that unknowingly packed himself inside his owner's suitcase survived 10 hours inside the luggage on a trip to, ironically, visit the world's most famous mouse. 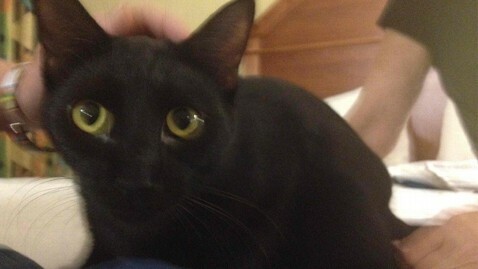 Bob-bob the cat was discovered Monday afternoon inside the suitcase of his owner, Ethel Maze, as the Circleville, Ohio, resident unpacked her bags at an Orlando, Fla., hotel near Disney World. Maze, the owner of a residential care home for disabled veterans, was in Orlando with her family and a group of 15 veterans on an annual trip to visit the home of Mickey Mouse and other local attractions. As she pulled out the usual shirts, shoes and shorts one takes on a Disney vacation, she saw something black and furry that she had definitely not packed herself. "I recognized it as a cat right away but I was afraid he'd died because he just laid there," Maze told ABCNews.com by phone today from Orlando. "I picked him up and said to my daughter, 'You'll never guess what. Bob-bob our cat is with us, in my suitcase.'" Bob-bob, it turns out, had climbed into Maze's suitcase back in Circleville early Monday morning but the group's flight was so early, 7 a.m., that a warning sign went unnoticed. "We have a young man who helps out and gets our luggage ready and he said it looked like a suitcase was moving but he thought he was imagining things," Mazel said. "We had been up all night getting ready so we thought nothing of it." Indeed the suitcase was moving, powered by one tiny but mighty kitten that survived the group's one-hour drive from their home to the Port Columbus International Airport, a run through the airport's X-ray machine and security screenings and a more than two-hour long flight stored in the airplane's cargo section. Once on land, Bob-bob's plight did not get any better. The group arrived in Orlando at 10 a.m., too early to check into their hotel so they left the bags at the front desk and went on their way. It was only at 2:30 p.m., 10 hours after their luggage was zipped and stowed way that morning, that Mazel unpacked and discovered Bob-bob. "He was so frightened," Mazel said. "He hid for about seven hours in our hotel room and only in the middle of the night came out and started licking us and purring." The group is staying in Orlando through Sunday, so Mazel made an emergency trip to a local pet store to pick up supplies for Bob-bob who is still trying to shake off his surprise vacation. "It's really taken until today for him to get normal," she said. "He's still kind of shaky. Today is the first day he's really eaten any canned food." The Columbus airport where Bob-bob made it through luggage checks and onto the plane says its security system is built more for bombs than accidental feline flyers. "Our machines are very sensitive to picking up explosives and other threats to aviation," Sari Koshetz, a TSA spokeswoman, told the Orlando Sentinel, which first reported the story.